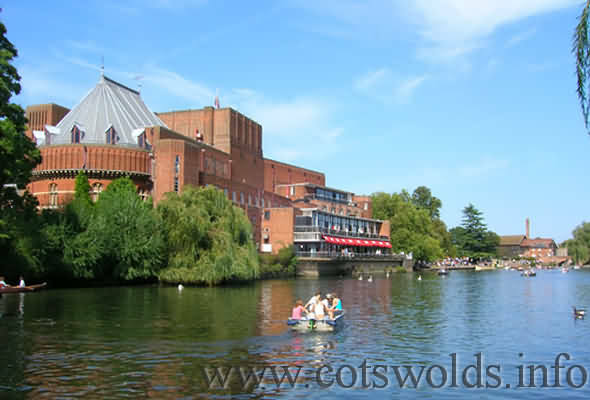 Stratford-upon-Avon is acknowledged across the world as the Birthplace of William Shakespeare with the Royal Shakespeare Company as the focal point for the production of the Bard's plays at any of its' three theatres. The aim of the Royal Shakespeare Company is to keep modern audiences in touch with Shakespeare as our contemporary. That means that as well as the work of Shakespeare and his contemporaries, the repertoire includes classic plays by international dramatists and work by living writers. The Royal Shakespeare Theatre, a large proscenium arch theatre (closed for redevelopment - architects Bennetts Associates). The Swan Theatre, an indoor version of an Elizabethan theatre (temporarily closed). The Other Place, a small black box theatre (temporarily closed). In Stratford the RSC currently performs in the Courtyard Theatre, opened in July 2006, designed by Ian Ritchie Architects and designers Charcoal Blue. As a working prototype for the new auditorium of the Royal Shakespeare Theatre it has a thrust stage and stacked tiered seating on three sides for 1,000 people. 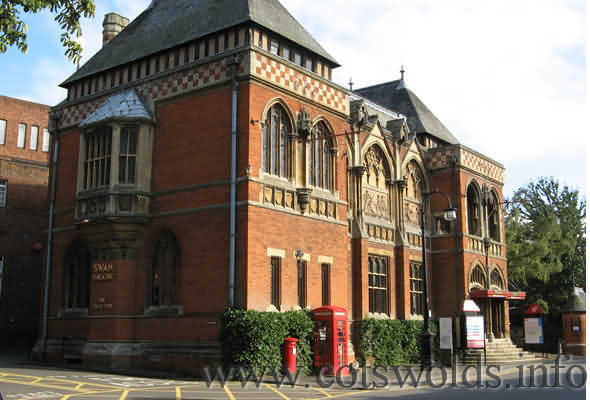 During the winter months, Stratford-upon-Avon's Civic Hall on Rother Street provides the RSC with a temporary second theatre. The Courtyard will be the Company's main performance space whilst the Royal Shakespeare Theatre is closed for transformation. But when the development is complete in 2010 the Courtyard will be dismantled and The Other Place will then re-open as the RSC's studio theatre. As part of this project the 432-seat Swan Theatre has also closed temporarily and will eventually share foyer space with the re-vamped RST. Box Office, Royal Shakespeare Theatre, Stratford-upon-Avon, CV37 6BB. The biggest of all the three RSC theatres in Stratford and also home to a shop, a bar and a restaurant, where you can dine in style overlooking the River Avon watching the boats and swans. Visit the Box Tree Restaurant for pre or after show meals. In the foyer of the Royal Shakespeare Company theatre you can buy plays and everything Shakespearian - books, cards, pencils, bookmarks, T-shirts and official RSC posters advertising the plays. The first theatre to be built in honour of Shakespeare opened in Stratford in 1879. Most of this building was destroyed by fire in 1926, but it was rebuilt and re-open in 1932. The Royal Shakespeare Theatre is currently undergoing a major transformation and will reopen in 2010. The Courtyard Theatre (see details below) is the Company’s main theatre while the RST is closed. The new Royal Shakespeare Theatre, this venue is soon to be re-opened and will have seating for 1000 and It will contain the largest thrust stage and tiered auditorium in the world. The Swan Theatre is a theatre owned by the Royal Shakespeare Company in Stratford-upon-Avon. It is built on to the side of the larger Royal Shakespeare Theatre, occupying part of the original Victorian Gothic structure that formerly housed the Shakespeare Memorial Theatre (mostly destroyed by fire in 1928). The Swan is a wonderfully atmospheric galleried playhouse. The new building was built in 1932 and the inside has been designed to reflect an actual Elizabethan style theatre. The Swan Theatre was to be dedicated to playing the works of William Shakespeare's contemporaries, the works of European writers and the occasional work of Shakespeare. The theatre was launched on 8 May 1986 with a production of The Two Noble Kinsmen by William Shakespeare and John Fletcher (not published until 1634 and thought to be Shakespeare's last work for the stage). It was directed by Barry Kyle. The Swan has subsequently been used for many other types of drama including the works of Chekhov, Ibsen and Tennessee Williams. The theatre is temporarily closed during reconstruction of the Royal Shakespeare Theatre. The 150 seat studio theatre is being used as the Foyer Space, Cloakroom, Bar Area, Dressing Rooms and Rehearsal Space for the RSC temporary theatre The Courtyard. The Courtyard has been added as an extention to The Other Place. 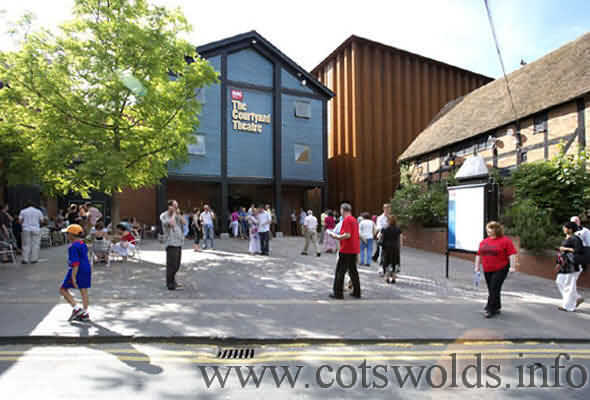 The new 1,000-seat Courtyard Theatre opened in July 2006 with Michael Boyd’s staging of the Henry VI trilogy as part of the Complete Works of Shakespeare Festival. 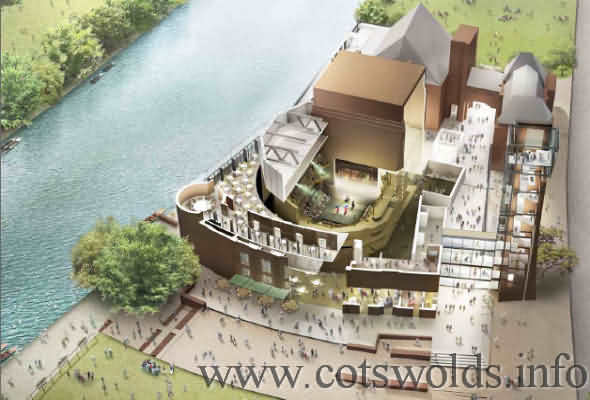 The new venue will allow the Company to continue performing in Stratford-upon-Avon during the transformation of the Royal Shakespeare Theatre. The Courtyard Theatre’s stage configuration will be a prototype for the redeveloped Royal Shakespeare Theatre. The Courtyard Theatre is the RSC’s main theatre in Stratford-upon-Avon while work on transforming the Royal Shakespeare Theatre is carried out. When the development of the Royal Shakespeare Theatre is complete, The Courtyard Theatre will be dismantled and The Other Place will re-open as the RSC’s studio theatre.